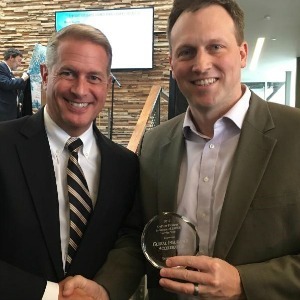 Global Insurance Accelerator was named the 2017 DuPont Pioneer innovationLEADER of the Year during the 4th annual innovationIowa Magazine Launch Party held April 5th at the Iowa State University Economic Development Core Facility. Award nominees were judged based on their originality, leadership, and impact on their company, state and local economy, and/or the general public through innovative concepts, processes, and/or products. The recognition was announced in the latest issue of innovationIOWA magazine, produced by Business Publications Corp. Global Insurance Accelerator is a mentor-driven business accelerator designed to foster innovation in the insurance industry by supporting startups targeting the global insurance industry. Past award winners were Harrisvaccines, Inc. and NewLink Genetics.